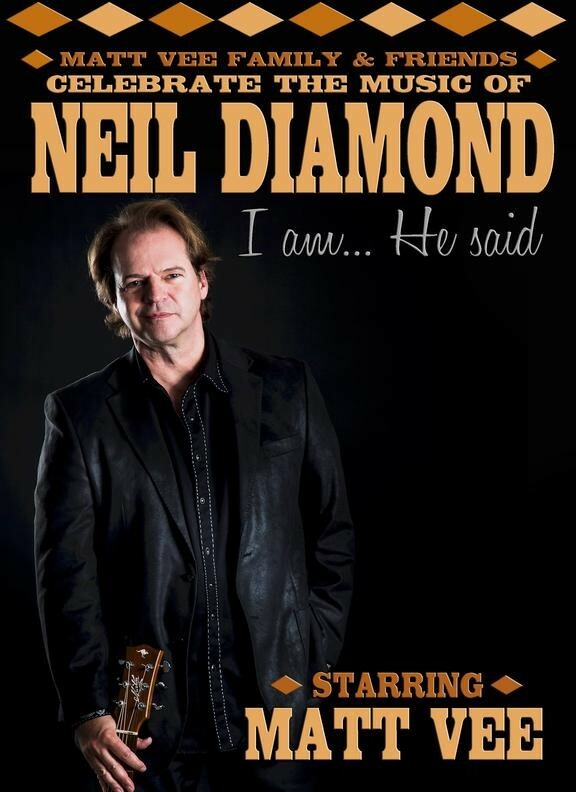 DES MOINES, IA ― Des Moines Performing Arts is thrilled to announce that the musical celebration, “I Am, He Said” – A Celebration of Neil Diamond – Starring Matt Vee, will be coming to the Temple Theater for two performances on Monday, Nov. 2, 2019 at 5 p.m. and 8 p.m. Tickets to “I Am, He Said” – A Celebration of Neil Diamond – Starring Matt Vee will go on sale Monday, April 8, 2019 at 9 a.m. and can be purchased at DMPA.org, the Civic Center Ticket Office, and by phone at 515-246-2300. A Celebration of the Music of Neil Diamond - Starring Matt Vee, nephew of 60's Pop-Star Bobby Vee - With songs like “Cracklin’ Rosie,” “Song Sung Blue,” “America,” “Brother Love’s Traveling Salvation Show,” and “Sweet Caroline,” Neil Diamond sold over 130 million records worldwide, and produced musical hits spanning five decades. Joining the Killer Vees band are Tommy’s son Bennett Vee on guitar, Matt’s wife Julie Velline on vocals, veteran Minnesota musicians Mark Levandowski, Kurt Rodman, Dennis Kennedy and Dr. Frank Plachecki, as well as a very special surprise for the finale! For more information, please visit www.MattVee.com or DMPA.org. Follow Matt on Facebook (/iamhesaid).